First Team's QuickSet™ provides quality net play and quick set-up without use of hazardous guy-wires! 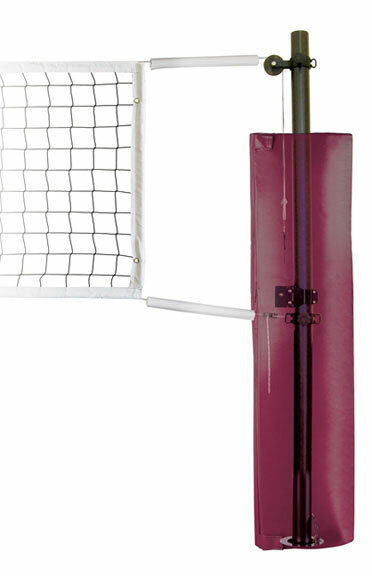 The QuickSet™ is the finest backyard volleyball set in its price range. The 2" square uprights are powdercoated black for competition styling. The galvanized upper sections telescope up and down to allow play at any height, men's, women's or junior. The QuickSet™ comes with the same high quality net and net tensioning device used on our higher end Blast systems. Choose from two QuickSet configurations to meet your specific needs. The QuickSet-PM comes with our permanent ground stems that can be cemented in place providing a solid, permanent net installation. The QuickSet-SP is a great choice when post removal is desired. The QuickSet-SP includes our ground/floor sockets that can be installed in any indoor or outdoor location, allowing removal of the posts for storage. All systems include competition grade upright padding, available in an array of colors. If you're looking for an economical backyard volleyball system that out performs the rest, get ready, get set, QuickSet!